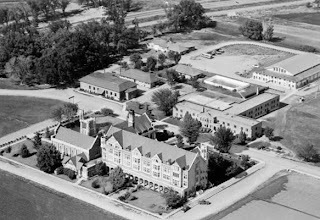 The Abbey of the Holy Cross in Cañon City, founded 1924, started out as a former monastery of the Order of St. Benedict in the United States. That same year, monks opened a boarding school for boys. In 1927, the school had its first graduating class. Boys who lived at the school took part in daily regimented activities: Up at seven, breakfast in the dining hall of the basement of the monastery building, then back to their rooms where they picked up their books and went to class. Chapel was every day before lunch, dinner at 6 p.m., study time, then lights out. When there was time for extracurricular activities, the students enjoyed swimming, tennis, and occasional trips to downtown Cañon City, where they took in a movie, or enjoyed a soda. 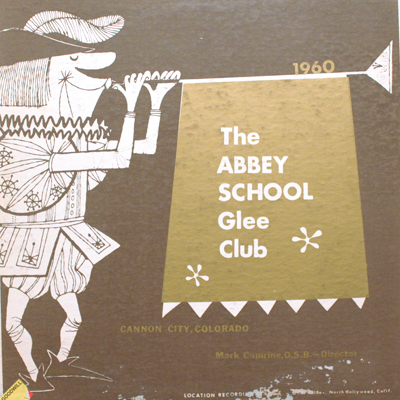 In 1960, the school's glee club recorded an album, "Songs of Yale." Bulldog on the Bank (Rob Carricaburu, Larry Didcoct, Don McLennan and Tom Anelmi). The school closed in 1985.